Three different Cheese Tools carefully designed and selected to provide the full range of cutting ability you want when serving on stone. 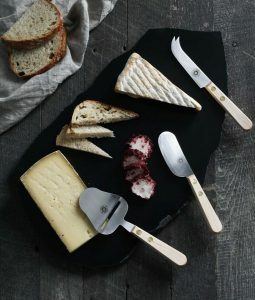 They are handmade in Massachusetts, and also happen to be the only set of cheese knives made in the USA! Each design features a stainless steel blade, maple handle, and brass rivets. Choose one or choose the Set of 3. Our Cheese Tools are handcrafted in Ayer, Massachusetts. 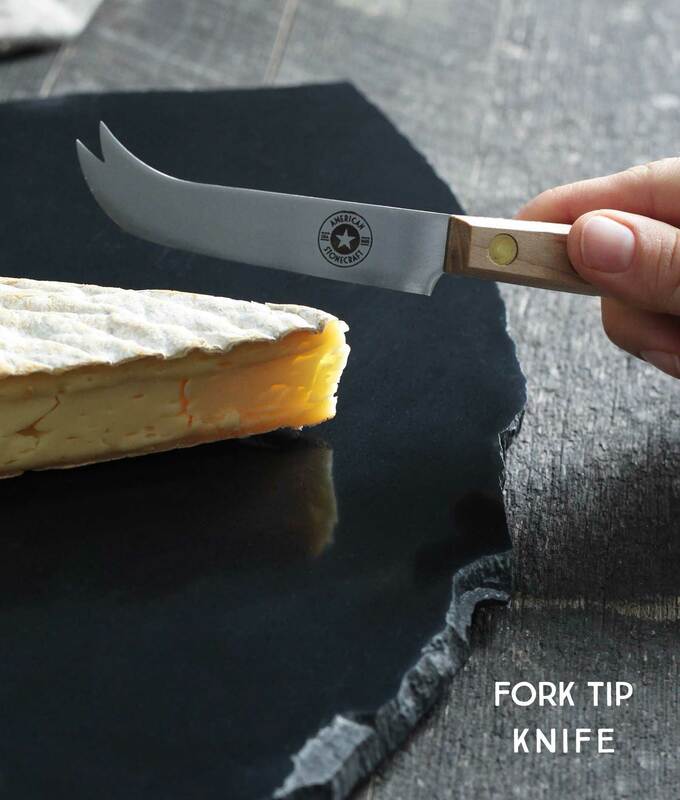 These cheese knives feature a stainless steel blade etched with the American Stonecraft logo. The comfortable maple handle is secured with brass rivets. Each design has been thoughtfully selected with serving on stone in mind. Available individually or as a Set. The Plane design is perfect for entertaining. Use it to easily slice a portion of medium to hard cheese without ever touching the cheese with your hand. 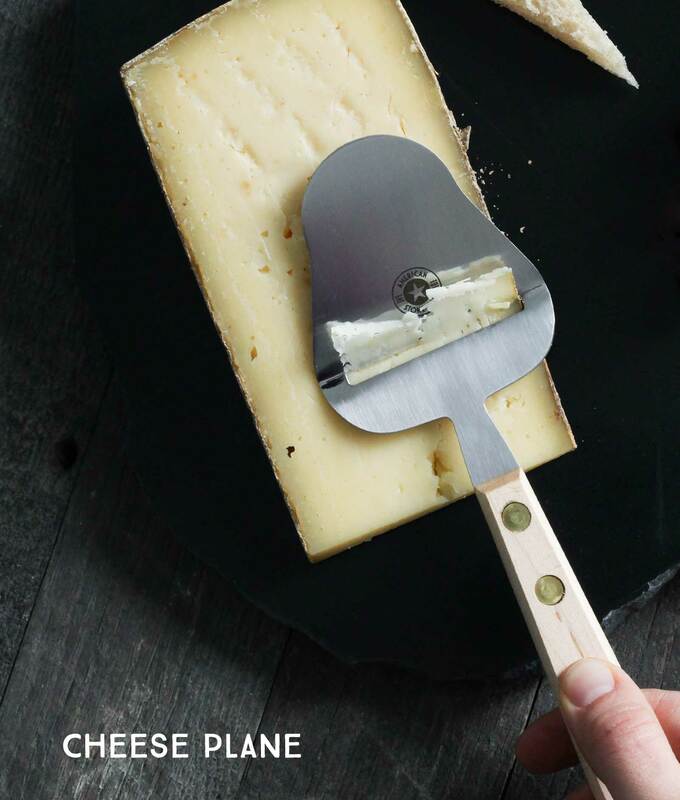 The slice of cheese rests on the far edge of the Plane, making it the perfect tool for passing cheese to your guests in a clean and mess-free way! A narrow blade allows this cheese knife to swiftly pass through any type of cheese, from soft, semi-soft, medium to hard cheeses. Use the fork tip to pick up your freshly sliced piece and pass it to a friend, or place it on a cracker. It’s also great for deftly selecting, pickles, olives, and charcuterie from your cheese board. 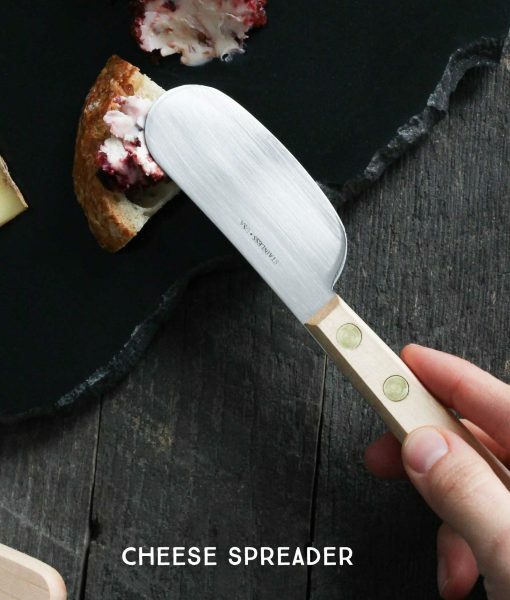 A wide blade provides ample surface for expertly spreading soft cheeses, honey, jams & jellies. The lower edge of the blade is sharpened to allow for slicing medium to soft cheeses.